ALL CLEAR: All earlier delays on Yonge University Spadina line have cleared. Regular service has resumed. We apologize for any incontinence. I’m not sure what caused the delays in the first place, but it must have been quite the mess. A little farther east on Gerrard there’s also a ghost Sunday stop, but it’s only visible as an area of faded yellow paint on a utility pole with no discernible lettering. This graffito at a Cosburn 87 bus stop has been flaking off for quite a while now. Whether it was authorized or just tolerated by the homeowner, it’s a simple yet fabulous site-specific artwork. 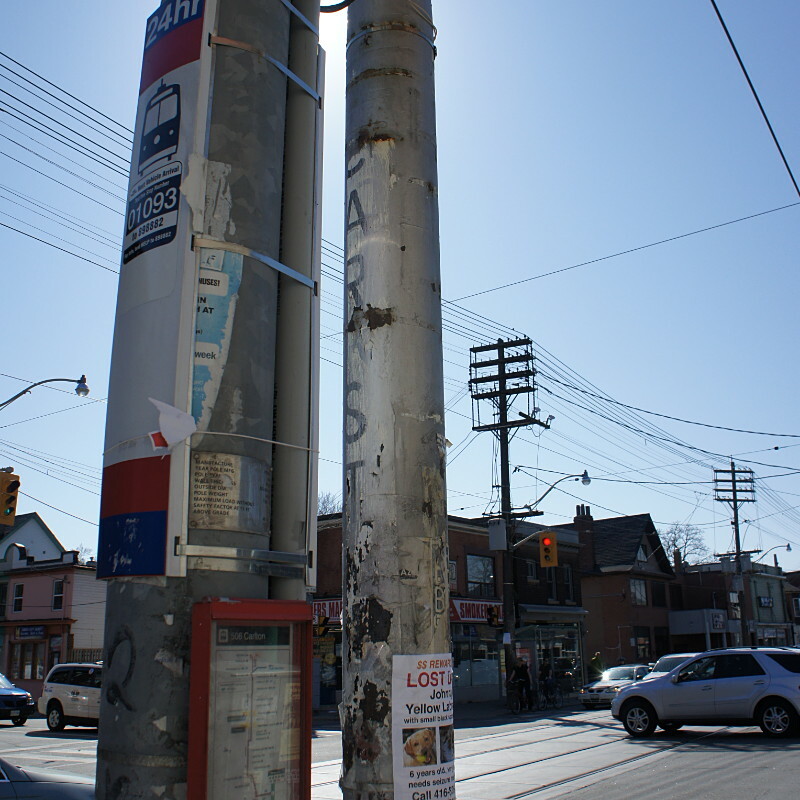 Before the TTC started marking bus stops by strapping mass-produced metal* vinyl signs onto poles, they used stencils and paint. I’m not sure when they stopped doing that, but I do vaguely remember the metal signs becoming standard in maybe the early 80s. 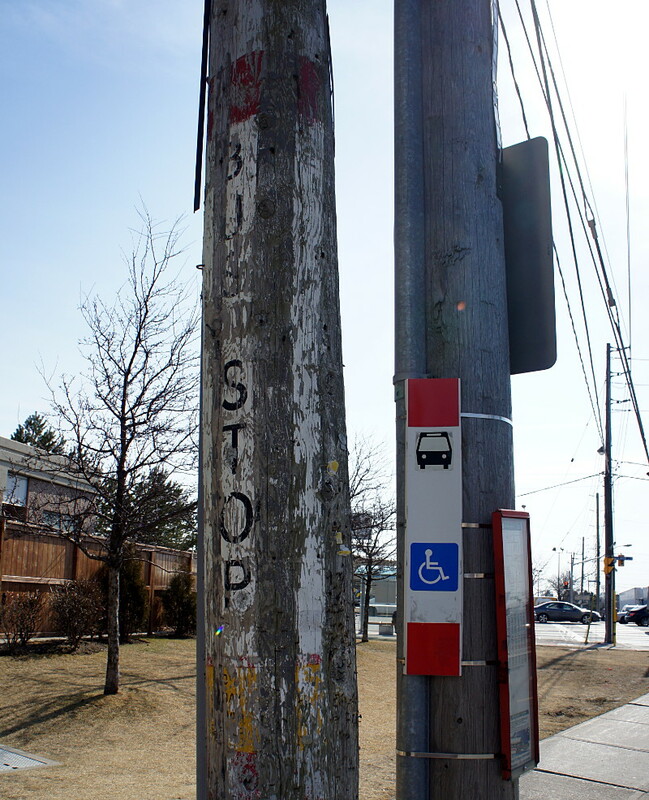 Most of those old painted signs have disappeared or faded with time, but a few of them are still kicking around on old streetcar and bus routes. The one above is painted on an old utility pole on the east side of Sloane Avenue just north of Eglinton Avenue East. 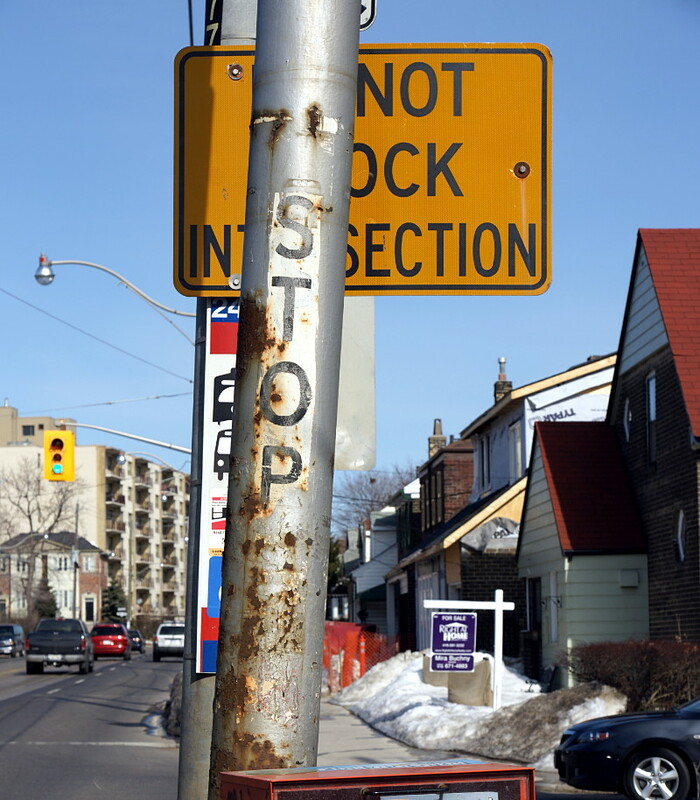 The old pole has been cut down to just above the ghost stop, leaving it with no role other than displaying a bit of old paint. As you can see in this Google Street View, the metal sign was strapped over the painted one before the new pole was installed. As you can tell by the snow on the lawns in the background, the picture wasn’t taken this winter. It looks like this stop was originally on a TTC-specific pole that carried the trolley wire for powering streetcars on this line. 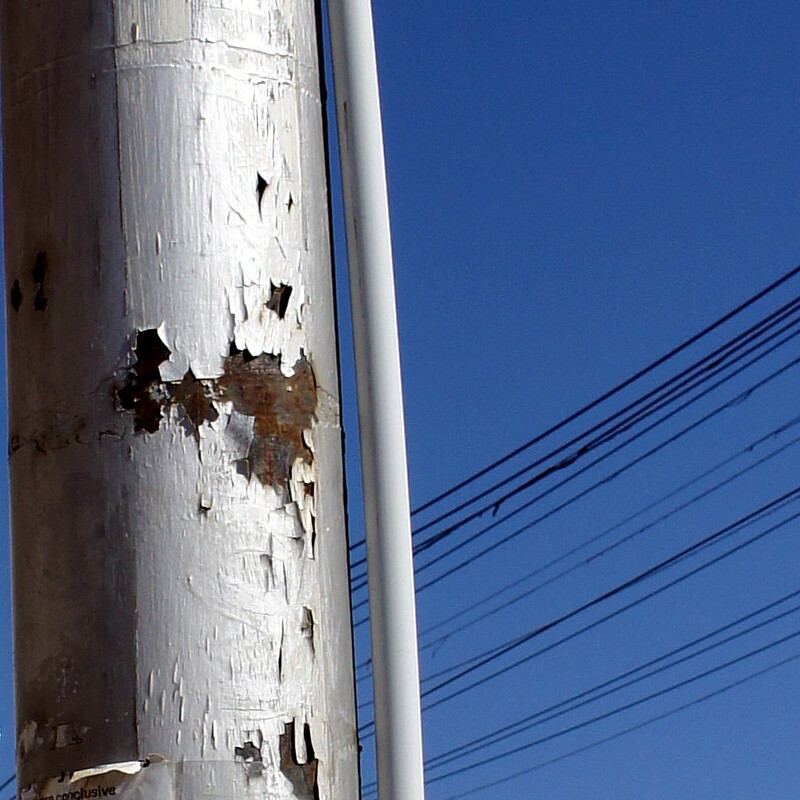 I’m not sure why the old pole survived; like the one on Sloane above, it seems to serve no specific function any longer. 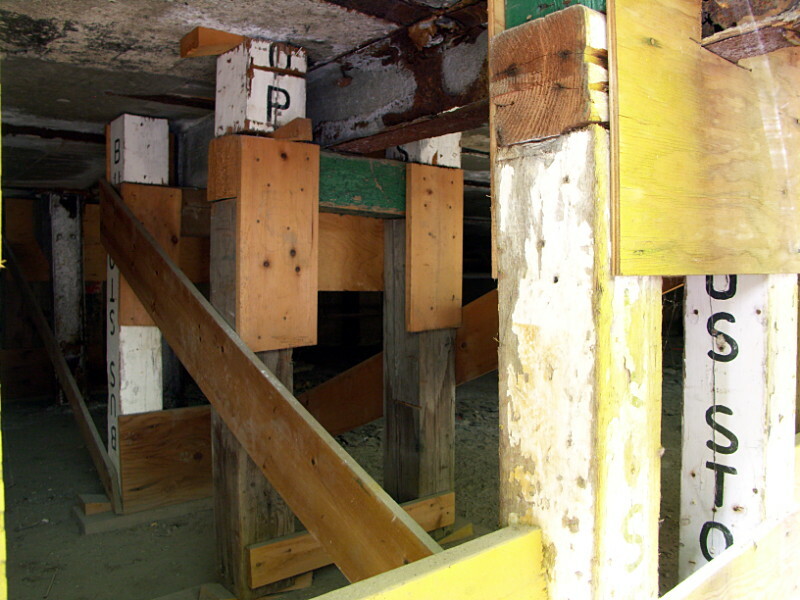 It’s extremely unlikely that any part of these ad hoc posts and beams survived the conversion of the buildings into the Artscape Wychwood Barns, but it was an amazing surprise to see when it was there. * Update, March 16, 2012: The newer non-painted signs are actually vinyl, not metal. When is it acceptable to delay someone's commute? I always marvel at how it’s okay for non-car commuters to suffer “minimal impact” to their travel times, but if a car commuter suffers the same “minimal impact,” everyone screams like it’s the end of the world. 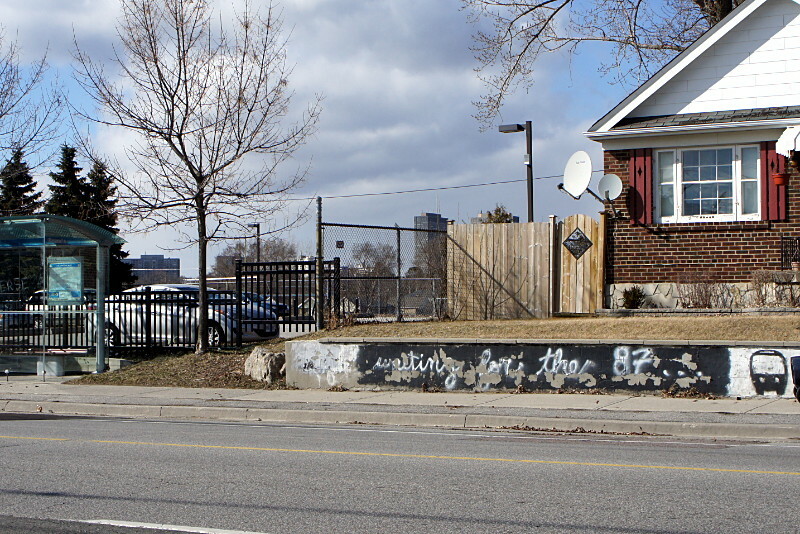 I believe that the language people use says a lot about their beliefs and intentions, so I find it interesting that someone like Rob Ford, in the two quotes linked above, basically sits on opposite sides of the congestion fence at the same time. In defending TTC cuts (or as he calls them, “service level modifications”), he co-opts the reasoning of cycling advocates who defend bike lanes, saying that a few extra seconds of waiting isn’t a big deal. 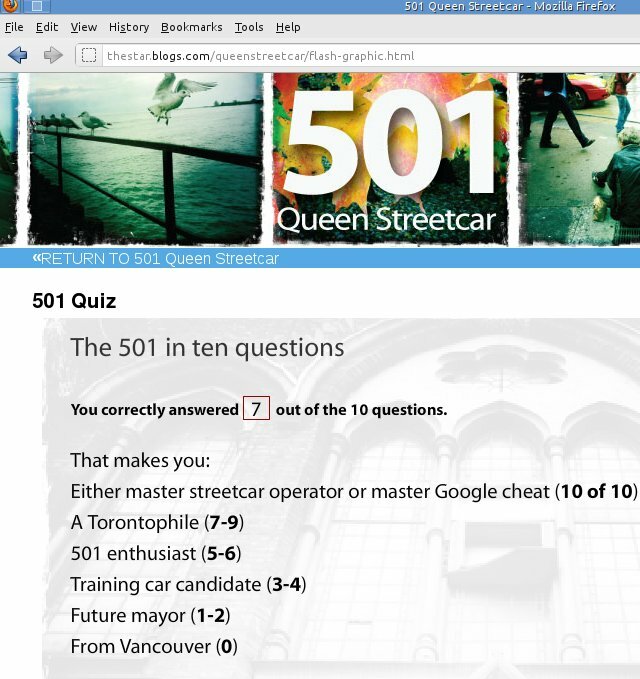 But in his case, he’s applying it to transit riders instead of drivers. It’s a perfect example of windshield perspective: delaying my commute by a few seconds is a travesty; but it’s okay if it happens to those other people. All those buses and bikes just get in my way anyway. My guess is that Ford will always rail against congestion while simultaneously taking actions that will only make it worse, all in the vain pursuit of saving a few seconds and/or dollars. The only question is how long this council will let him get away with it. A family of ducks on the SRT tracks has caused the TTC to hold service on the line temporarily while we humanely work to relocate them. I always hear about old streetcars sitting out in farmers’ fields or doing duty as storage sheds in the middle of nowhere, but I’d never seen one for myself until this past weekend. This one is on Finch Ave in Pickering, just east of Scarborough-Pickering Town Line. I would have gotten in closer for some pictures, but the place was plastered with ‘no trespassing’ signs and there was no one around for me to ask about it. I assume that they’re tired of having transit and photo geeks crawling all over their property, but what do they expect with a rusting old PCC sitting in their front yard?